Exercise 2 – The application of spherical trigonometry in the solution of navigational problems. This post continues the series of navigation related exercises which were requested by navigation and maths teachers. When the post expires, its contents will be included under the menu heading ‘Navigation Exercises’ on the home page. Objective. To exercise the application of the cosine rule in the solution of spherical triangles. Part 1. Revising the application the cosine rule in the solutions of plane triangles. Part 2. 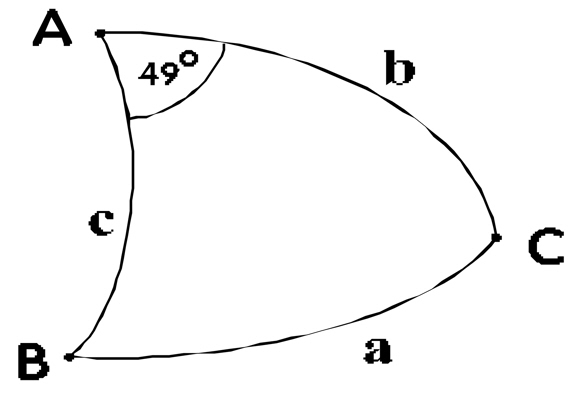 Applying the cosine rule in the solution of a spherical triangle. To revise spherical trigonometry click here. Part 3. Applying spherical trigonometry in the solution of a navigational problem. 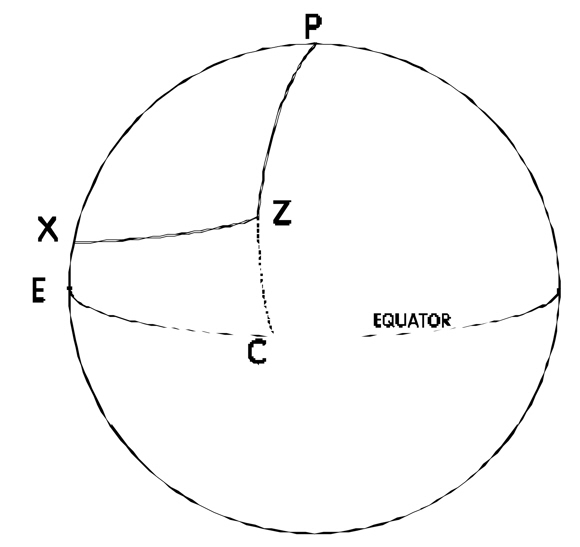 C represents a point on the Equator that lies on the same meridian of longitude as point Z. Task: Given the following: Lat. = 45o North, Dec. = 18o North, and Time = 3 hours after noon, find the distance of the observer from the Sun’s GP. Angle ZPX = 45o (since 3 hours = a time angle of 3 x 15o). therefore distance of observer from GP = 2767.8 n.m. (since 1′ of arc on the earth’s surface = approx. 1 nautical mile). Part 2 example problem: Can you mix linear quantities (meters) and arc degrees at will? I’d think not. Am I missing something? Thanks.